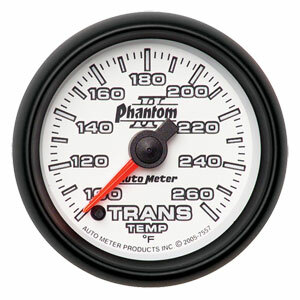 Auto Meter Phantom II gauges are a revolutionary redesign of the popular white-faced Phantom series. Created using race proven Auto Meter components, Phantom II has been infused with superior lighting technology, providing "at-a-glance" readings day or night. All models feature white dials by day with bold black outlined white numbers and markings for a unique look. At night, Phantom II instruments utilize a reverse lighting effect to create a dark dial that radiates intense, bright white light through the numbers and increments via Auto Meter's signature LED "through the dial" illumination. Patented, high contrast, glowing red pointers ensure accurate, easy to read information. Not just for street use, Phantom II gauges feature competition-bred movements in Short Sweep Electric, Mechanical, and Full Sweep. Electric Stepper designs. Gauge includes 1/8 NPT sensor and light kit.